Amidst all the swirling controversy regarding anthropogenic global warming (AGW), a subplot has arisen that involves me rather more directly than most of the science regarding global climate change. In particular, some climate scientists (among them is Dr. Kevin Trenberth) have been making what I believe to be highly speculative claims about the climatology of severe weather in a world affected by AGW. The essence of the situation is that Trenberth has been claiming in various media that there will be more tornadoes in an AGW-influenced future, and that the "tornado season" will start earlier and be more violent than ever. In my studies of severe convection and tornadoes, I have not been willing to make any statement regarding the potential impact of AGW on the occurrence frequency of tornadoes. Why so cautious? First, the existing record of tornado events is seriously problematic, even here in the US - it's much, much worse outside the US, unfortunately. The existing record of tornado occurrences simply will not support any speculation about trends in the observed events, in large part because the existing record is overwhelmingly dominated by non-meteorological artifacts in the data. I've spent the last 40 years exploring that record (along with several colleagues, including Dr. Harold Brooks). I have a number of peer-reviewed publications related to the topic of severe storm and tornado climatology. Those data simply don't allow us to make any statement whatsoever about long-term trends. Second, although it seems likely that increasing global average temperatures would increase evaporation, making the average atmospheric humidity rise and thereby making it possible for increased thermal instability and possibly stronger updrafts in thunderstorms, there are some other factors associated with AGW that could mitigate that. In particular, with the AGW being more pronounced in the polar regions than near the equator, the result would be a decrease in the horizontal temperature contrast between the poles and the equatorial regions. That, in turn, would result in a decrease of vertical wind shear. Decreasing vertical wind shear would be notably unfavorable for the development of tornadic supercells. There might be an increase in overall severe storm activity because of increased buoyancy, but the resulting storms might be less likely to become tornadic. Third, the details of just what a future dominated by changes from AGW would be like remain speculative. 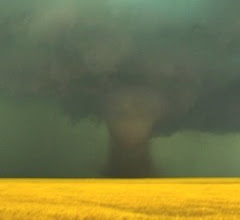 There could be regional variations in the frequency of conditions favorable for tornadoes, irrespective of what the global average conditions might be. Thus, tornado frequency in some regions might increase, and yet could decrease over most regions, leading to an overall decrease - that is, some areas could buck that global average trend and actually show an increase in frequency. I've been a consistent supporter of the consensus of global climate change scientists regarding AGW. This is because I have no research findings of my own that could gainsay that very strong consensus. I know some of the scientists who are part of that consensus and I have great respect for their work. The general findings regarding AGW are consistent with what I know about meteorology, but climate change is not my domain of expertise. It would be foolish for me to dispute the findings of the consensus represented by the IPCC reports, since (a) this is outside my domain of expertise and, (b) I have no rational evidence-based reason for such a dispute. What evidence I see is overwhelmingly supportive of the consensus, which is why I believe it's such a strong consensus. But in the case of tornadoes, a few climate scientists (e.g., Dr. Trenberth) are overstepping their domains of expertise. If I give them the respect that their work is due in an area within which I have no record of peer-reviewed publications, I would expect them to do likewise regarding the work I (and my colleagues) have done in an area wherein these climate scientists have no record of peer-reviewed publications. I don't speculate about global climate change, so I have every reason to expect them not to engage in unfounded speculation about tornado occurrence frequency. Update: Dr. Kevin Trenberth informs me that he has never said in so many words that the tornado occurrence frequency will increase as a consequence of AGW. If that's the case, it's another instance of media misquotations. I hope he will take steps to correct these misrepresentations of his position, if that's indeed what they are. It doesn't work that way? Oh, really?